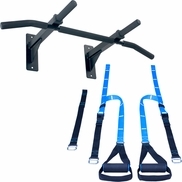 The Ultimate Body Press Pull Up Bar for 9ft Ceiling or Wall Mounting makes every workout complete. The 1.25" diameter bar, textured grips, 22" risers and jig welded gussets give gym grade performance and maximum versatility. 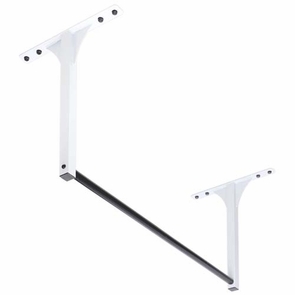 Designed for easy installation with mounting holes spaced 48 inches on center this pull up bar is ideal for both ceiling and wall mounting to 16 or 24 inch spaced wall studs or joists on any floor of your home or commercial location. 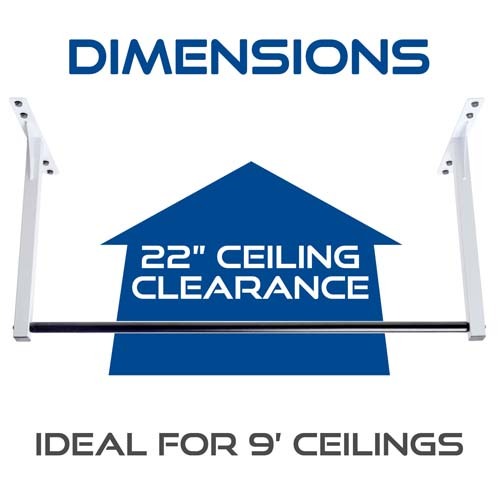 Explore your mounting options and preserve floor space with 22" bar clearance for maximum range of motion. 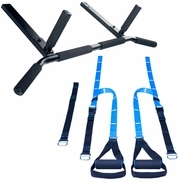 Build whole body functional strength with traditional pull up bar exercises for your arms, chest, back and shoulders or use the Ultimate Body Press Pull Up as an ultra stable anchor for accessories like Ab Straps, Gymnastic Rings, and Suspension Trainers so you can design your own full body fitness program. 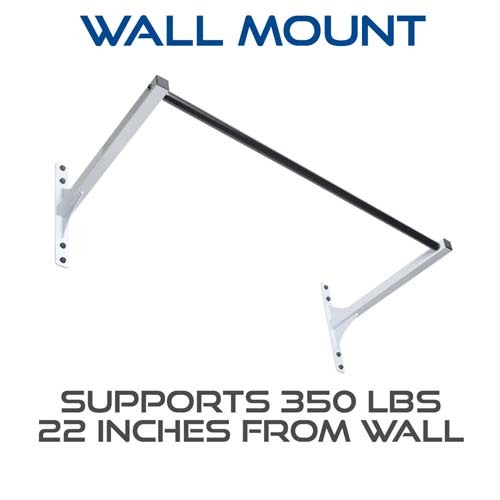 Whether you choose a wall or ceiling mounting, your rigid mount bar will let you focus on form and reps with every workout. Start your home bodyweight gym the right way with a mounted pull up bar. The mounted bar is ready to go any time of day for even the briefest workouts so you can always build on your momentum and progress. Question: What is the maximum weight capacity? 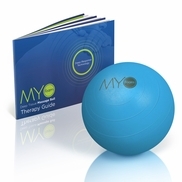 Question: When will this product be available? Question: COULD THIS PRODUCT BE SECURED TO A CONCRETE WALL WITH CONCRETE ANCHORS? Answer: Yes. You will have to purchase masonry anchors separately. Question: What is the weight for shipping? Question: Hello. Do you ship to the UK? Question: Does it come with mounting hardware? 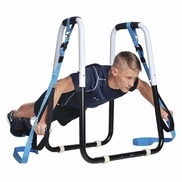 Question: Will this pull-up bar support "kip"-style pull ups? Question: Can it be mounted horizontally on the side of joists? Question: what if my studs are not exactly 16" centered. Are any of your machines adjustable? Answer: Our Pull Up Bars are not adjustable. 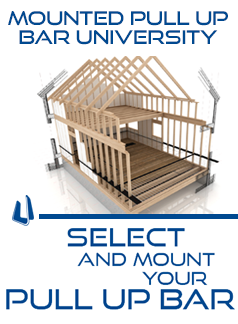 We would recommend mounting the pull up bar to 2x4 boards then mounting the boards to you wall. 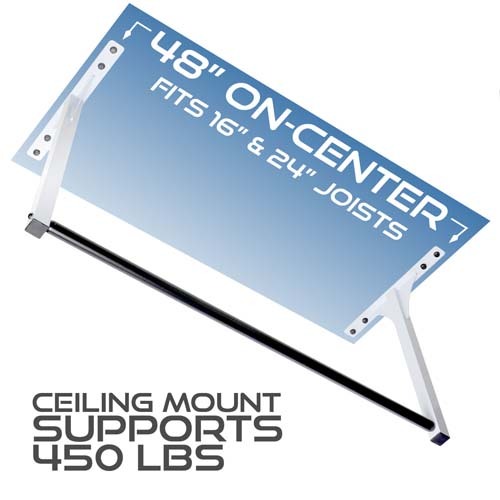 Question: Trying to understand the dimensions on the ceiling mount pull up bar. If hung from the ceiling, how far down is the bar from the ceiling? Question: Can this be mounted through drywall into studs? Answer: Yes, that is what it is designed for. Question: How far out from the wall is the actual bar on which you do the pullups? Question: when is this item expected to be back in stock? Answer: We do not have a replenishment date at this time. 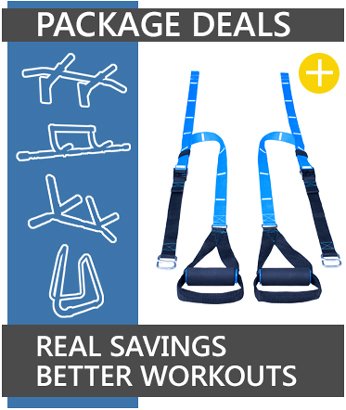 Question: When will the pull up bar be available for shipping? Answer: This pull up bar is now available. Question: Were there any issues with safety and/or installation? I noticed that the drill bit dimension is larger on the enclosed instructions than what is printed on this page. Also there is no reference to a 1/2" drill adapter on the enclosed instructions, which is different than that on the website. Finally, there are instructions to drill the holes at least three inches deep. Answer: There are no safety issues. We have increased the size of the hardware that is why the instructions in the box require a larger bit. 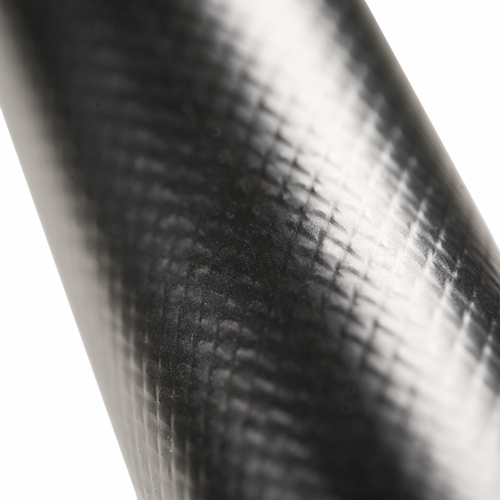 The depth of the pilot hole is relative to the length of the lag bolt; 3 inch bolt = 3 inch pilot hole. A socket adapter is recommended so that you can drive the bolts using a power drill rather than a wrench which if done without care can break any bolt head. Question: How much will it cost to ship to Singapore? Question: When will this product be available again?? Question: Does this bar come with the necessary nuts and bolts to attach bar to a wall? Question: What is the length of the part of the bracket that goes against the wall?